Social media isn’t just a way for us to send memes, find entertaining videos or keep up with the latest pop culture trends. It’s one of our primary forms of communication. 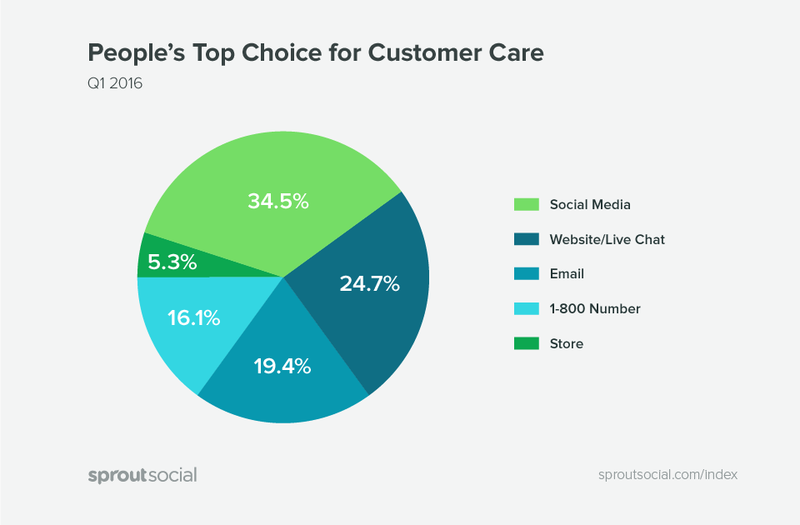 In fact, social media was ranked as people’s top choice for customer care in our Q2 2016 Index. The use of social media to communicate extends to government as well. One of the biggest benefits of Twitter, Facebook and Instagram is ease of communication. Social media makes it easier for citizens to voice their opinions, and for the government to hear them. Whether it’s a city updating citizens about a new ordinance they need to be aware of, or the US Department of State using YouTube to to share press briefings, social media has made communication between citizens and government much easier. While the process is more convenient than it was five years ago, using social media for citizen engagement is still a fairly new process. As such, there’s definitely a lot of room for improvement. Government bodies have had their share of challenges on social media. 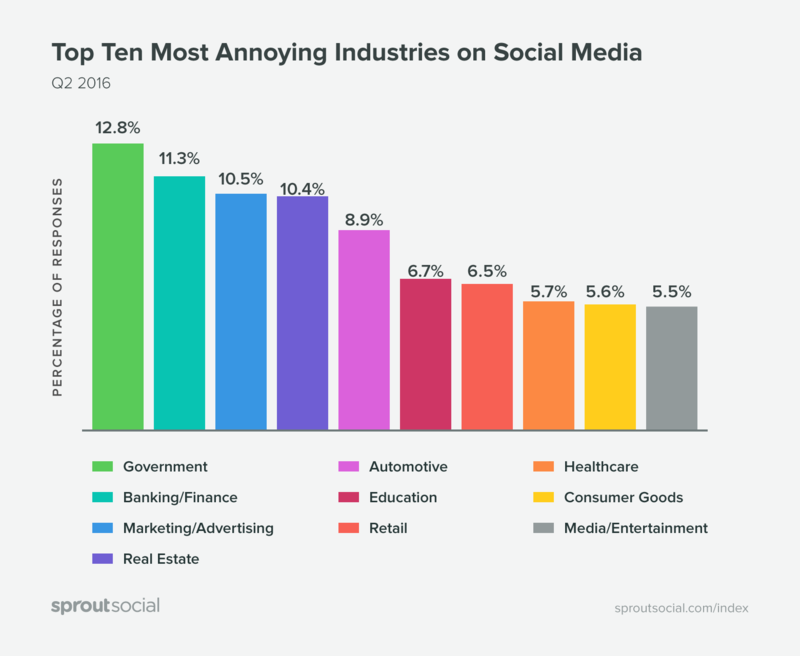 In our Q2 2016 Index, government was ranked as the most annoying industry on social media. It was also shown to be the least liked industry as well. With an average response time of 10.7 hours, and only an 8.91% engagement rate, it’s partially understandable why there’s such negative sentiment about government and social media. Needless to say, things could be better. Not to worry though, we’ve got you covered. Before we dive into the how, it’s important to understand why social media is helpful for government. No matter what area of the public sector you’re in, the people you serve are on social media. They’re asking questions and voicing their opinions. One of the worst things you can do when people are trying to engage is ignore them. It’s even worse for government agencies because there’s already a negative stigma attached to their level customer service. Social media presents a great opportunity to change that perception. Acknowledging incoming Tweets or replying to Facebook comments can be enough to show an effort. If you want to make the public aware of new legislation, promote a cause or just inform citizens of important news, social media is the best place to do it. Mail is often just thrown away and never read, email delivery can be unreliable and just posting information on your website doesn’t guarantee that anyone will see it. 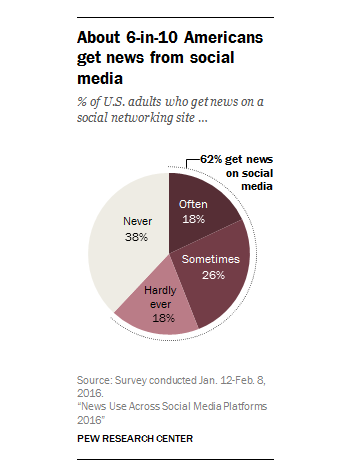 In fact, 62% of US adults get their news from social media. Plus, information spreads easier on social media. People can share your Tweets or Facebook posts with the tap of a button, and immediately put it in front of their friends, family and colleagues. Whenever a major crisis happens that directly impacts citizens, keeping the public well informed and up to date can build trust and provide some transparency. While you may not be able to share certain sensitive information, an occasional Tweet can go a long way. For instance, The Virginia Department of Emergency Management regularly Retweets updates that locals should be aware of. Social media can be used to create an information hub for the public. It saves resources of having people try to call different offices to figure out what’s going on, and eliminates the issue of conflicting information coming from several sources. When people want to know your stance on a particular issue or what’s going on, they can check the official Twitter Handle or Facebook page. Now that you know why social media can be great for government, let’s take a look at how to use it successfully. This is probably one of the biggest areas of improvement for government entities on social media. Because of the massive reach you can get on platforms like Facebook, Instagram and Twitter, it’s easy to think of them as purely distribution channels. However, they’re much more than that. Social media is one of the best ways to engage with citizens. 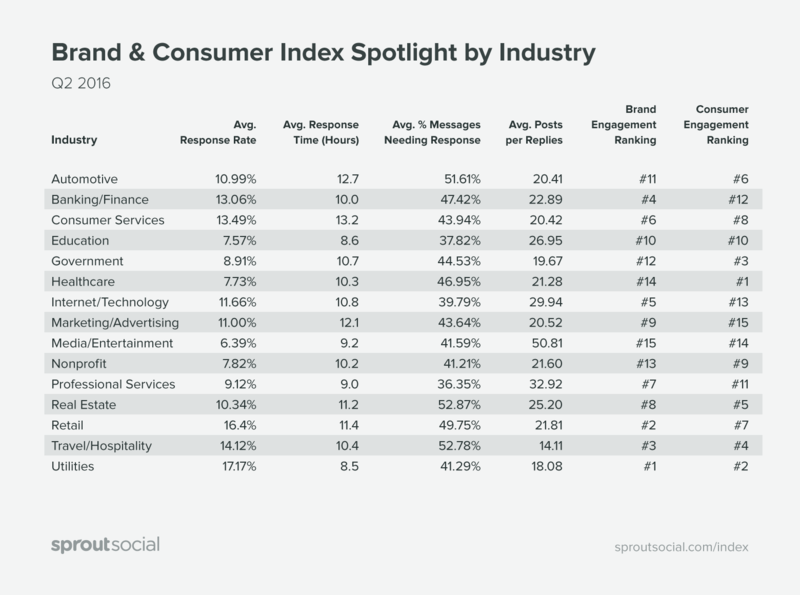 Take a note from B2C and B2B brands and think of social as a platform for conversation and customer service. While you may not be selling products and services in a traditional sense, you still want to keep your your customers (in this case citizens) happy. A good place to start is by not ignoring them. Engaging with your audience is also a good way to be humanistic and break the “faceless government” stereotype. The City of Las Vegas Twitter account does a great job of replying to incoming Tweets with some personality. Even though your social media profiles may represent your entire office or department, it’s always nice to show that there are actual people behind the Tweets. That way people feel like they’re being heard and acknowledged. This is even more important when citizens voice their frustrations. The Chicago Transit Authority does a great job of replying to the large volume of questions and concerns from commuters on Twitter every day. Government bodies tend to excel at sharing informational content. Educating the public about how to respond to certain crises or giving tips on your city can be a good way to provide valuable content that people want to consume. For instance, FEMA Tweets safety tips that are helpful and relevant. Think of common issues and challenges your audience faces, then create content that addresses it. You can go the route of FEMA and create a custom graphic with tips, or you could create a blog post and share it on Facebook and Twitter. 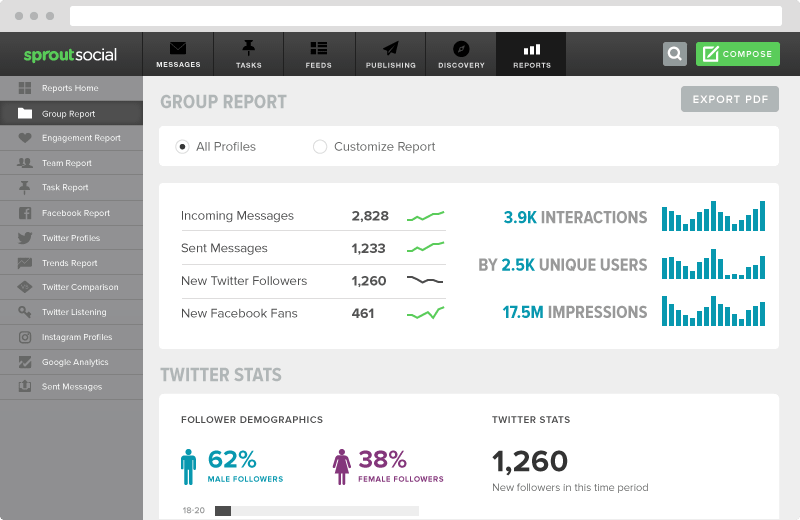 Social listening allows you to get a better understanding of who is your target audience. It goes beyond just looking at the incoming Tweets, Facebook and Instagram posts where you’re tagged. With social listening, you’re trying to get a pulse for what your audience is talking about and their interests. For government that could mean looking for conversations about local events or issues with city policies. For example, the Parks department may be interested in what specific parks or nearby areas people like to visit during the spring and summer. To get started, check out our social listening guide. The basic process is to identify important keywords or hashtags you want to monitor, then look for trends in how often they’re used as the way they’re used. 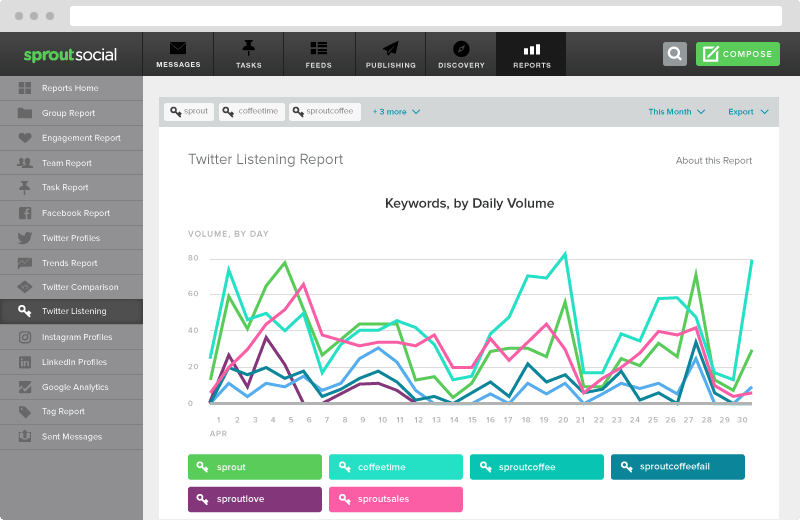 Sprout Social’s social media listening report can make things much easier. Create content: Use social listening to find new ideas for content to create and share. Get a feel for the most popular topics people mention then create related articles, videos or social media posts. The best content is the kind that people actually want to consume. Make improvements: Social listening can also show you where your shortcomings are. Look at common issues people mention in regards to your department and think of ways to improve it. Gather public sentiment: You can use social listening to get a general idea of public sentiment about new policies, events or initiatives. Whether you’re trying to spread the word about an upcoming event, election or policy change, use social media as a channel to spread the word. As we mentioned, one of the biggest benefits of social media is the ability to spread information quickly and to a wide group of people. People like to know what’s going on where they live. Turning your social media channels into sort of a local bulletin board makes it easier for citizens to stay up to date. You likely already have certain events and initiatives planned throughout the year. Get ahead of the game by creating corresponding social media campaigns for them. 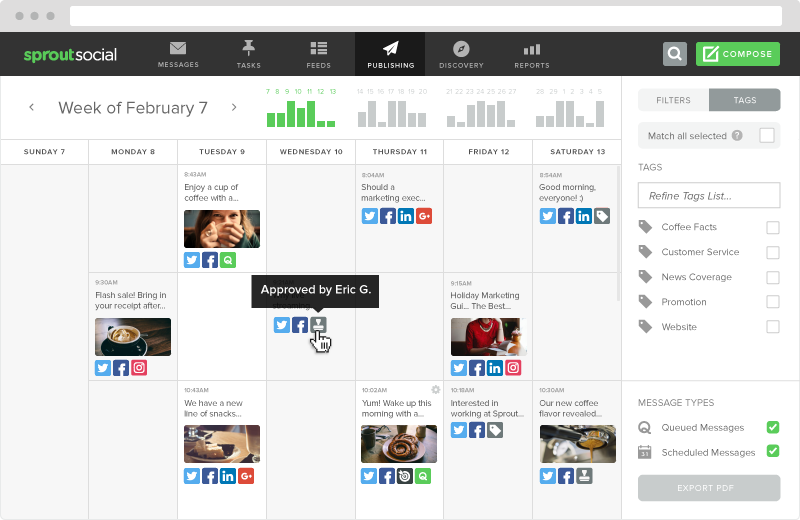 You can use Sprout’s publishing tools to schedule your social media content in advance, so you’re not scrambling to get everything done at the last minute. When you’re sharing content and putting together campaigns, it’s helpful to know what’s actually working. In order to do that, you need some kind of social media analytics tool. That’s where Sprout comes in handy. Our software allows you to measure engagement, track hashtags, spot trends and get an overall view of how your social media efforts are going. So who’s doing it right? Balancing entertaining and informative content while managing an influx of public opinion and maintaining privacy and security isn’t easy. It’s tough but not impossible. Here are a few examples of government agencies with brilliant social media presences. The Center for Disease Control and Prevention uses Facebook as a place to help educate citizens on different illnesses, the spread of diseases and other important health information. One thing the CDC does particularly well is making the topics easy to understand. While you may have never heard of conditions like diphtheria before, the CDC gives a high-level view of what it is and advice on how to protect your children. While most people may not find illnesses and health precautions to be the most compelling topics in the world, the CDC makes it work very well. The takeaway: Present your content in a way that’s easy for people to consume. Whether it’s through custom images, bite-sized pieces of text or videos, make sure your message comes across clear and is easy to understand. While you may not enjoy the hassle of going through the TSA security lines, you might actually enjoy taking a scroll through the official TSA Instagram account. The account has plenty of images of items people have tried to bring through security at various airports. But instead of just showing objects like crawfish, they use it as an opportunity to educate travelers on what they can and cannot bring. The TSA Instagram page touches on an important piece of the social media success puzzle—relatability. While you may have never specifically Googled “Can I take crawfish through airport security,” you’ve likely searched for something similar. And that’s what TSA is appealing to—the curiosity people have about non-traditional things they’re allowed to travel with. On top of that, these posts allow TSA to promote their other services like TSA PreCheck or even the @AskTSA Twitter Handle. The takeaway: Share content your audience can relate to. It’ll encourage them to engage and build a stronger community on your social channels. Not only is NASA at the forefront of space exploration, but it also leads the way in terms of social media and government. NASA has social media covered across the board on Facebook, Twitter, Instagram and YouTube. You may not know it, but NASA was also one of the pioneers of Google+ as well. In fact, the NASA Google+ page is still updated regularly. NASA is the perfect example of how government organizations can use various social channels in a unified strategy. Here’s an example of how NASA used multiple channels for a single campaign. 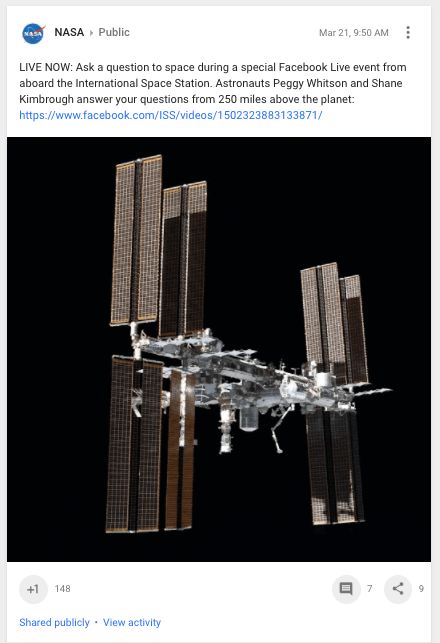 In order to promote a Facebook Live stream, NASA Tweeted and posted to Google+ about it, pointing people to their Facebook page to view. Notice how NASA tailored each post to the network it was on. The Tweet has @mentions and the Google+ post is a little longer since they’re not limited to 140 characters. All their promotions linked to the video below, which was a live stream. The Takeaway: Don’t be afraid to use multiple platforms. And if you want to publish a similar message on multiple channels, tailor your content to match each network. One of the biggest advantages social media has for government is its ability to connect government departments with the citizens they serve. The Boston Police Department strives to do this by highlighting the interactions between officers and the community. One of the best things the department does is keep things visual. Nearly every Tweet is accompanied by a photo or video. Plus, they even dabble in the occasional live stream. The takeaway: In addition to interacting with the public on social media, citizen engagement can also mean sharing content that showcases the connection between government and citizens. Also, take a note from the Boston Police Department and incorporate photos and visuals to stand out. The federal government relies on social media primarily to monitor what people are saying about specific programs and events, and then use that information to improve strategies and services. Of course, the words “federal government” and “listening” may cause some people alarm, so it’s important to know the law. The Privacy Act includes provisions that protect personally identifiable information (PII) of citizens. As a result, agencies need to take precautions not to report information that can be used to uniquely identify, contact or locate an individual. A common form of this is usernames, which is why creating influencer lists isn’t recommended. A username is a unique identifier and can be linked to a specific individual. So maintaining a list of usernames would be considered a violation of privacy. In the supporting document, the Guidance for Agency Use of Third-Party Websites and Applications, it’s stated that if the collection of PII is necessary, then the agency should collect only the minimum required to accomplish a purpose. It’s recommended that social media managers working in government meet with legal counsel and privacy officers when developing social listening and analysis strategies to ensure that appropriate policies are followed and any necessary protections have been taken. While most social networks have an age requirement—13 years—that doesn’t mean younger individuals aren’t participating. Signing up for a social network is a fairly unregulated process: All it takes is selecting a different age from the drop-down box or entering in a different year of birth. The Federal Records Act requires the preservation of any official “record,” which includes all books, papers, maps, photographs, machine-readable materials and other documentary materials made or received by an agency of the government. In 2014, the act was amended to include electronic documents. As individuals create, edit, comment on and share content on social media, that results in the creation of federal records. While it’s the responsibility of the agency to determine which records they create or receive, it’s best to include all ingoing and outgoing social media, including posts, comments, photos and reviews on third-party platforms, such as Facebook, Twitter, YouTube, Instagram and LinkedIn. Note: A complete record must have content, context and structure along with associated metadata, such as author and date of creation. While most platforms do retain records, they’re not kept over long periods of time, and in some cases, communications can be modified or deleted by users. This significantly limits the amount of control agencies have over the process. Alternatives, such as taking screenshots or using personal backup tools, are difficult to maintain and pose challenges when it comes to locating records later. To help with this effort, Sprout Social retains social records for the duration of your subscription so you don’t have to worry about archiving. If you plan to have an active social media presence, you can draft and publish messages as well as export your records as needed. Does it contain evidence of an agency’s policies, business or mission? Does the agency use the tool to convey official information? If you’ve answered yes to any of the above questions, then the content is likely federal record. You’ll also want to consult with a records officer about what data will be collected and why, how it’s used or shared, how it’s stored and secured and how long it’s kept. Social media has provided an amazing way for government bodies to engage with citizens. With careful planning, the right tools and everything you learned in this guide, you can start putting together a strategy for success. Start looking at social media as a way to engage and interact with the public, and you’ll get much more from it. Sprout Social makes it easier to manage conversations and get an in-depth look at public reactions to your campaigns, programs and policies on social media. Get started with a free 30 day trial!